MIlan Barnyk scored a consolation goal for Phantoms against Guildford. There will be no silver lining for Peterborough Phantoms at the end of a fine season. The English Premier League and EPL Cup runners-up saw their play-off defence come to an end at the semi-final stage in Coventry this evening (April 2). Phantoms netminder Janis Auzins played well in the play-off semi-final defeat at the hands of Guildford. Phantoms could be forgiven for being sick of the sight of the Guildford team who defeated them 4-1 at the Skydome, and who had also been their cup final conquerors at the beginning of last month. 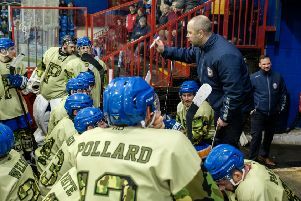 Coach Slava Koulikov was quick to identify the reasons for Phantoms’ latest loss at the hands of the Flames – the concession of goals at poor times. His men fell behind in the final minute of the opening period, saw their deficit double in the penultimate minute of the second session and then conceded again early in the final period as the delight of 2015 turned into the disappointment of 2016. Koulikov said: “It is certainly a very different feeling to lose in the semi-final this year than to lift the trophy last year. Tom Norton was denied a goal for Phantoms by an excellent save by the Guildford netminder. “It is a shame that we didn’t put in our best performance. We conceded at some really bad times and we could not recover from that. “All the goals are very tough to take. There is a rule that you don’t concede in the first or final five minutes of a period, but all of Guildford’s goals arrived in those times. Phantoms fell behind to a Tom Duggan strike with 31 seconds of the opening period remaining. The puck had been in their net much earlier in the contest only for the goal to be disallowed as it was kicked-in by a Guildford skate. Phantoms had been frequently frustrated by the excellence of Flames netminder Richard Ullberg in the first session and that proved to be the case again in the second period. The Swedish shot-stopper made big saves from Tom Norton, Ales Padelek and James White before Phantoms saw their arrears increase as Flames import Janis Ozolins got the better of namesake Auzins. For the second successive stanza, Phantoms out-shot their opponents only to see the deficit grow, and it increased again early in the third period as Ben Campbell burst away to beat Auzins in a one-on-one situation just as a Phantoms powerplay was coming to an end. And the game continued to follow a familiar pattern with Phantoms unleashing plenty of rubber in the direction of Ullberg, who was equal to it all until finally being beaten in the last minute. Only 19 seconds remaining when Milan Baranyk hit a consolation for Phantoms, but there was still time for Guildford to respond with an Andrew McKinney empty-net goal only six seconds later. It was a sad end to an often sparkling season and meant there was no fairytale finish to the career of long-serving defence Jason Buckman, who retired after the game. Meanwhile Koulikov admits he has much to ponder in the coming weeks. He added: “It is too early to think about our plans for the future as we have to review this season first. “There is no denying it has been a disappointing end, but I can’t fault the guys for they way they battled so hard all season. League champions Basingstoke were pipped 2-1 after penalty shots by Milton Keynes in the earlier semi-final. They now face Guildford in the final tomorrow (April 3, 4pm).